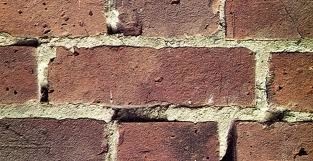 Here’s a trick to replacing the mortar, or grout, between the cracks of a brick wall, or “repointing”, Concave style. Surely many of you recall a mom, aunt, wife, decorating a cake by squeezing a cake bag while decorating the edge or what have you, on any celebrated occasion where cake is called for. . Well, the trick to replacing broken, chipped, or missing mortar can be very similar. Find a soft, but leak-proof and flexible bag found at any hardware store, and this do-it-yourself, speedy, way of repointing is well on its way to becoming a much faster and easier job. Make sure the bag is about 18-24 inches in length, (cut it if necessary), 16-24 inches wide, or any length and width that is comfortable and allows you to be able to manage it once you pour the concrete mortar inside. Now cut a small hole in the corner of the bag at that the mortar can easily be squeezed through the hole, making sure it’s not too large, however, so that just enough mortar is able to flow through and fill the cracks in your wall. Then just do it. It’s easiest just to go over the entire area you need, in sections of 6 feet at a time, before moving on to step two: “the tool”. The tool is a simply a curved steel jointing rod found at all hardware stores, the mortar’s shaping gadget that will then be used to go over all of you newly filled-in, cracked, spots. You merely need to scrape curved end along the joints and voila, it now look professional and is water-resistant because its formation compacts the mortar and its shape directs the water away from the seal! Rinse and repeat. Soon your entire wall will look great and be perfectly sealed.